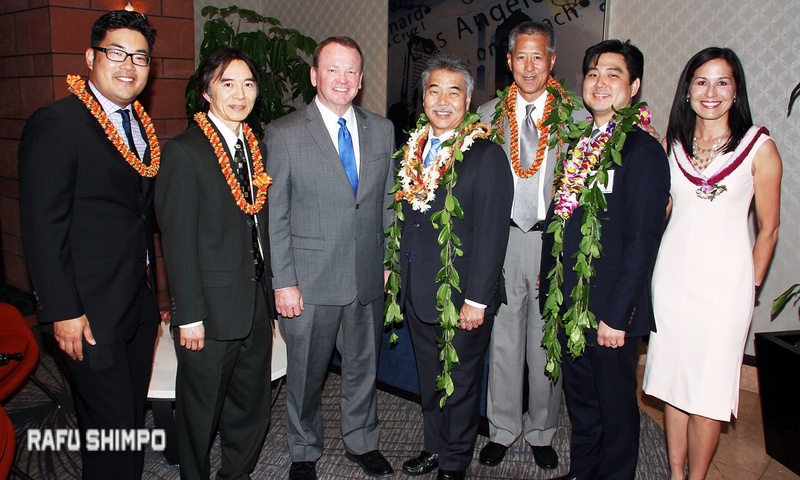 From left: Mark Furuya, JABA president-elect; Kenneth Tanaka, immediate past president; honoree Sheriff Jim McDonnell; Hawaii Gov. 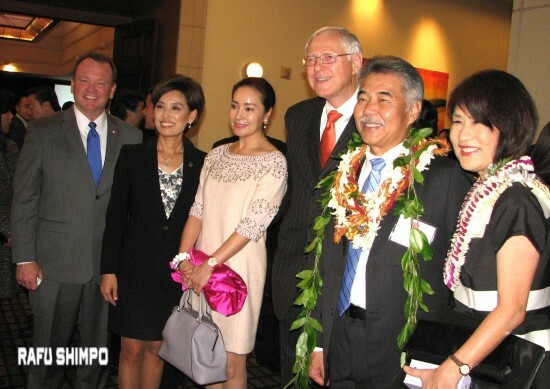 David Ige, keynote speaker; honoree Hoyt Zia; Mark Arimoto of Hawaiian Airlines; JABA President Sabina Helton. There was a distinctly Hawaiian theme at the Japanese American Bar Association’s sold-out 40th anniversary installation and awards gala, held April 1 at the Omni Hotel in Los Angeles. 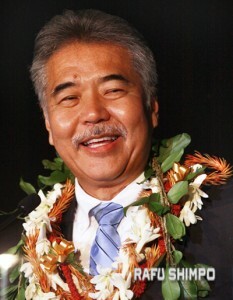 The keynote speaker was the governor of Hawaii, David Ige, two of the three award recipients had ties to the Aloha State, and the event opened with a performance by Halau Keali’i O Nalani, a local hula group. Halau Keali’i O Nalani performed. “As a young man, my father, Tokio Ige, had limited options in his life. He grew up on Ewa Plantation, again with only an eighth-grade education. On the morning of Dec. 7, 1941, when the bombs fell on Pearl Harbor, their lives changed forever. At first the War Department classified the Nisei … as 4C, enemy aliens unfit for service. The Nisei had learned one of the most important values, a debt of gratitude, an obligation, to be grateful to the land of their births, America. They were eager to prove their loyalty. “My dad volunteered to become a member of the 100th Battalion/442nd Regimental Combat Team during World War II. Their service is legendary, the most decorated battalion for its size and length of service in U.S. history. After the war, the Nisei soldiers returned to Hawaii and were subjected to much of the same discrimination that they had met before the war. But they had been changed. After proving their loyalty to America in the war, they were committed to the cause of equal rights for all of the residents of Hawaii. “Dad earned a Purple Heart and a Bronze Star, and he never talked about it … never sought recognition. He was a hard-working construction worker who provided for six boys, making sure that we had an education. He believed that was the access to a better life, and each one of us completed college. I imagine many of you have similar stories. You too had fathers and uncles who fought for our country, mothers and aunts who kept things together at home during the war. It was an enormous and unimaginable task for all. Ige, who was accompanied by his wife, Dawn, also visited the Japanese American National Museum during their stay in Los Angeles. The Inspiration Award was presented to Hoyt Zia, who has just retired as senior vice president, general counsel and corporate secretary for Hawaiian Airlines. The presenter was Audra Mori, past JABA president. Zia helped start many Asian American bar associations, including the National Asian Pacific American Bar Association, of which he was the founding president. He went on to private practice, served in the Clinton Administration, and worked with various companies. Former JABA presidents gathered on stage. Being back in L.A. was “like Old Home Week, seeing friends I haven’t seen in 20, 30 years,” he said. He cited the Vincent Chin case in Detroit, and the reopening of Fred Korematsu’s World War II Supreme Court case, which his wife Leigh-Ann Miyasato worked on. The Unity Award was presented to Hawaiian Airlines by JABA President Sabina Helton, who noted that it is the eighth-largest airline in the U.S. with direct flights to such destinations as China, Korea, Japan, Australia, New Zealand, Tahiti and Samoa. 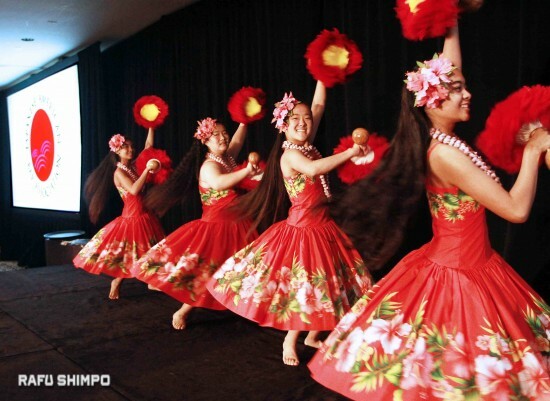 “But beyond just transporting people around the globe … Hawaiian Airlines has been quietly putting together projects to bring people together in so many ways,” Helton said. “For example, it is a major supporter of the Hokulea, a double-hulled canoe built and navigated in the traditional manner of the Hawaiian ancestors … The Hokulea crew is circumnavigating the world to remind people of their basic connections and broadcasting their message of sustainability to school classrooms from a modernly equipped sister ship. Mark Arimoto, director of A321 (long-range aircraft) integration, accepted on behalf of President and CEO Mark Dunkerly and more than 5,000 employees around the world. Judge Mark Hanasono (right) swore in the JABA Board of Governors. David Ono of ABC7 Eyewitness News served as emcee. Opening remarks were made by JABA President Helton, President-elect Mark Furuya, JABA Secretary Mike Madokoro, past president Alex Fukui and outgoing president Kenneth Tanaka. There was a tribute to Diana Harumi Nishiura, who passed away on Jan. 9. Throughout her 40-year legal career, she served for many years on JABA’s Board of Governors, including one as president in 2010, spearheaded the formation of the JABA Educational Foundation in 2005, and served as its vice president and on its Board of Directors. She retired last year as a senior attorney for the California Department of Business Oversight. 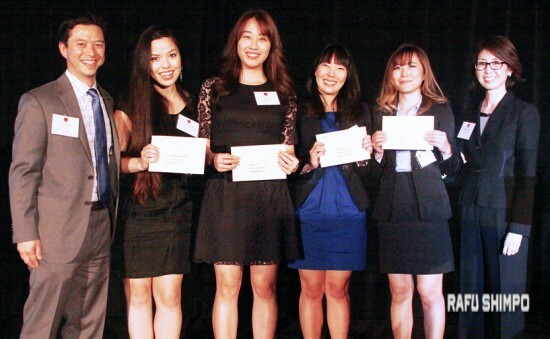 From left: Jeff Maloney, Scholarship Committee co-chair; scholarship recipients Alexandra Johnson, Bora Lee, Alyssa Fujii and Mai Suzuki; Scholarship Committee Co-chair Allyson Sakai. Judge Edward Y. Kakita Memorial Scholarship — Alexandra Johnson, second-year law student at UC Davis School of Law, member of UC Davis Law Review, an editor of UC Davis Business Law Journal, co-president of Asian Pacific American Law Students Association. Justice Stephen K. Tamura Scholarship — Alyssa Fujii, first-year law student at UCLA School of Law, member of Asian Pacific Islander Law Student Association and Environmental Law Society. Justice John F. Aiso Scholarship — Mai Suzuki, second-year law student at Pepperdine University School of Law, treasurer of Environmental Law Society and member of Entertainment and Sports Law Society. Lim Ruger Foundation Scholarship — Bora Lee, second-year law student at Southwestern Law School, president of BISON, an a cappella group, vice president of APALSA. The 2016-17 Board of Governors was sworn in by Los Angeles County Superior Court Judge Mark Hanasono. In addition to Helton, Furuya, Madokoro and Tanaka, officers are Harumi Hata and Ryan Iwasaka, vice presidents; and Kira Teshima, treasurer. There are 18 other governors. JABA recognized 27 past presidents, who gathered on stage for a group photo. A silent auction and raffle benefited the JABA Educational Foundation. 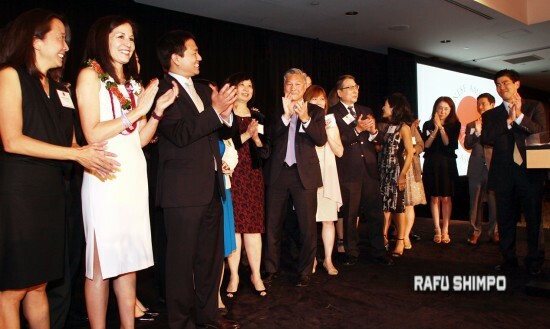 Raffle tickets were sold during the dinner by members of the Nisei Week Court. The event concluded with closing remarks by Helton and a drawing.